A horde of robot commandos are attacking your base from the skies above. You control a single gun which you must aim and fire to stop the invaders, but don't run out of ammunition, or your base will certainly be destroyed. When a robot parachutes to the ground, it will walk towards your base and stand beside it. When A robots gather on one side of the base, they will destroy it and the game will be over. The enemy ships include satellites, jets, and helicopters. Satellites fly past at high speeds, but they cannot harm your base directly. Jets fly overhead quickly, and the pilot will eject if you fire enough shots at it. Helicopters drop parachuting robots as they pass. Friendly UN Helicopters will drop extra ammo on your base if you let them fly peacefully overhead. You will lose points if you destroy them, and you might run out of ammo. If you shoot the falling ammo box, it will act as a smart bomb which will destroy everything in the sky, plus all walking robots on the ground, plus one standing robot from each side of your base. As you can see, it is sometimes a good idea to destroy the ammo box in order to keep the robots from overtaking your base too soon. When you shoot down a satellite, jet, or helicopter, it will explode, and flak from the explosion will fall a certain distance. If this flak hits another ship or robot, the that ship or robot will be destroyed as well, and its flak will continue to fall. By lining up your shots carefully, you can take out many ships and robots by taking advantage of these chain reactions. The more ships you include in a chain reaction, the larger will be your point bonus. If you destroy a target with your bullets, you will receive the point value for the target as listed above. However, if the flak from that target destroys a second target, the second target will be worth double its basic point value. Then, if the flak from the second exploded target destroys a third target, the third target will be worth A times its basic point value. Likewise, the fourth and fifth targets in a chain reaction would yield 0 times, and 16 times their basic point values, respectively. Clearly, the best way to maximize your score is to carefully plan these chain reaction shots to take out several ships at once. But be careful - if you destroy the friendly UN helicopter in the reaction, its negative point value will be increased as well, and you could end up losing points. The radar screen shows enemy ships approaching from both directions, so it is a very useful guide when planning your flak chain reaction shots. This selection from the Options menu allows you to change which keys are associated with which commands. The default choices are left arrow to rotate left, right arrow to rotate right, and spacebar to shoot. This selection from the Options menu allows you specify single fire or auto fire mode, enable or disable the radar screen, and specify how much ammo you start with. To pause a game in progress, press either the ESCAPE key or any Windows system key (such as ALT, F10, etc]. 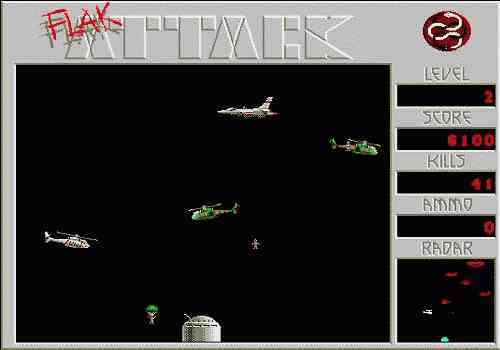 To quit playing Flak Attack, simply close the game window.